This was out 15th cruise and 3rd with Princess. Not sure there will be a 4th. The Caribbean Princess is a poorly designed ship. Major design issues make it impossible to get from the front of the ship on Deck 6 to the Palms on Deck 6 in rear of the boat. Example: go up a set of stairs to Deck 7, walk the length of the ship and then walk down to Deck 6 again ( there are no passenger elevators, only service elevations). Not ideal for those with mobility issues. Not a great place to have breakfast during debarkation although it is the only available option. Imagine lugging your carry on up and down stairs. I was surprised to see smoking allowed in their small casino. The casino on Deck 7 is also in front of the special sale tables Princess sets up. The smoky air from the casino make you feel like you are shopping in an ashtray. Since the ship was sold out it was difficult to participate in the ship activities, or find a lounge chair by the pool, or get a seat in the Explorer lounge. The ship offered a great comedian and magician with 45 minute shows. I was shocked to see the production shows were cut to 30 minutes although they were good but not great. 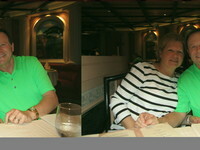 This was out 15th cruise and 3rd with Princess. Not sure there will be a 4th. The Caribbean Princess is a poorly designed ship. Major design issues make it impossible to get from the front of the ship on Deck 6 to the Palms on Deck 6 in rear of the boat. Example: go up a set of stairs to Deck 7, walk the length of the ship and then walk down to Deck 6 again ( there are no passenger elevators, only service elevations). Not ideal for those with mobility issues. Not a great place to have breakfast during debarkation although it is the only available option. Imagine lugging your carry on up and down stairs. I was surprised to see smoking allowed in their small casino. The casino on Deck 7 is also in front of the special sale tables Princess sets up. The smoky air from the casino make you feel like you are shopping in an ashtray. Since the ship was sold out it was difficult to participate in the ship activities, or find a lounge chair by the pool, or get a seat in the Explorer lounge. The ship offered a great comedian and magician with 45 minute shows. I was shocked to see the production shows were cut to 30 minutes although they were good but not great.